This advice is all about discipline, including punishment. Punishment is an ugly word to some. Reality check: Discipline cannot be established without punishments. Use it for annoying behaviors, failure to adhere to an adult’s “No,” or visible breaking of rules. 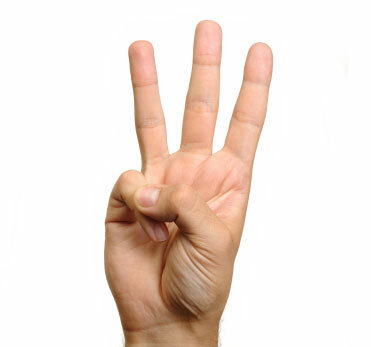 Here’s how to put One, Two, Three into action through a strategy I call One, Two, Three – Tag, When annoying behavior or minor rule breaking occurs, say “One.” Continued disobedience gets a “Two.” “Three” gets a punishment and Tag announces the punishment. TAG can be used with One, Two, Three or as a stand alone disciplinary plan. For teens, it works best as a stand alone plan. Example one: T = Tell. Hitting is not allowed. A = Announce: Off to the time out chair until the bell rings. G = Controlling your temper takes time to learn; I know you will learn betters ways of saying you are angry as you get older. Example two: T = Tell. The school called and said you cut three classes today. A = Announce. You won’t get any good behavior money tonight. G = Give. You did better yesterday. I hope you can get your act together again soon. I know you like doing things the right way. It is up to you. Example three: T = Tell. I am missing $5.00 from my pocket book. A = Announce. As we agreed, when I miss money, your allowance pays. G = Give. I would like to give you all the money you want, but I can’t. What happens next is up to you. The rules are clear. After you TAG a child, end the conversation then and there. With a teen who tries to argue, leave the room while saying something like “I don’t have time to discuss this.” You might want to read about what I call “Gotcha Wars” for it is a favorite ploy of some teens and aimed at winning their wars of rebellion. ONE, TWO, THREE and TAG should only be used when a child has broken a punishable rule. Moreover, punishments must be known before hand. The punishment should also be able to be enforced without the child’s consent. Extra work is a good punishment and often useful to help a child prove he or she is willing to learn from the experience or make amends for misbehaving. However, extra work does require the child to cooperate, however, so should always be paired with a punishment that does not require cooperation. Taking away a privilege—not being able to play with a special toy, loss of special time with a parent, no dessert with dinner, loss of television time, loss of telephone privileges, or for a teenager with a driver’s taking away use of the family car, are examples of privileges that can be removed. WARNING: Some parents take away holiday presents, birthday parties, vacations, visits with a parent who lives elsewhere or visits with other treasured relatives. These are not privileges but important ingredients in the mix that mean a child feels cared for and must never be used as a punishment. Stop trying to be a perfect parent. Not only possible but to often define in this day and age as keeping the kids happy and never, ever, punishing. Bah humbug. Punishment merely means pain applied following behavior. If the punishment is a beating, then it is abuse. For tips about proper punishing see this post of mine. Unless you are abusive, if you provide food and shelter, encourage education, if you work to teach values and manners, love your child and s/he knows it you are a good enough parent. Bask in that idea. Remember sharing is caring and share this post if you found it useful or think someone else will. One, Two, Three Magic promotion video Phelan does not share much, but this will give you a hint of his approach. Moreover, the videos are inexpensive and well worth the price. This entry was posted in Parenting Issues and tagged challenging children, Emotional fitness, Katherine Gordy Levine, parenting, Parenting advice, parenting tips, Parents Are People Too, postaday, Practiicing kindness, teens, When Good Kids Do Bad Things. Bookmark the permalink.